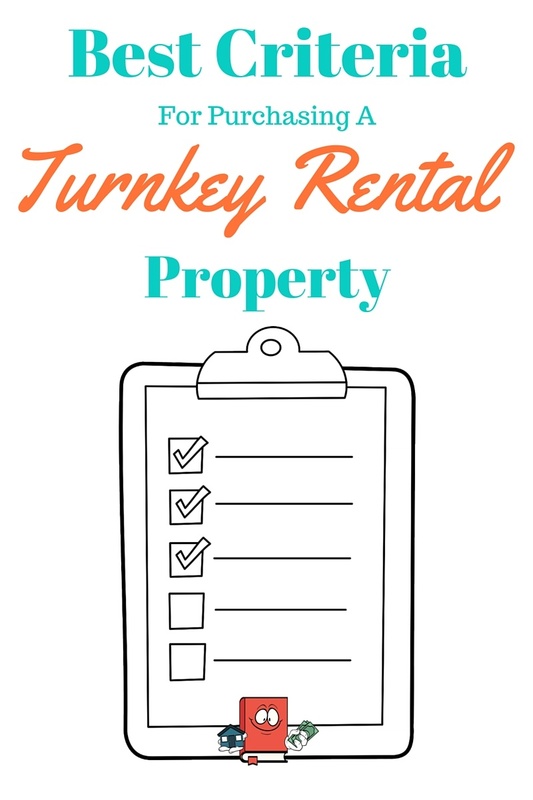 Everyone has different criteria for buying turnkey rentals. What I’m about to share is my specific criteria that I use for purchasing rental properties. Right now I am concentrating strictly on out of state turnkey properties because I’m not able to get the kinds of returns I want in my current home market. Plus so far I’m having a great experience purchasing turnkeys and I think its kinda fun!! If it ain’t broke, don’t fix it! Here is my criteria in no particular order. At least 15% COC (cash on cash) returns. I try and get as accurate numbers as i can get when I’m in the due diligence portion of reviewing a particular property. This includes actual interest rate that I’m approved for by my lender, actual tax value, actual insurance quote, estimated rent price, estimated future maintenance and estimated future vacancy. Please make an important note that when you run these numbers in your calculator that you are using your own numbers from your own due diligence. Turnkey providers like to provide these kinds of numbers for you and usually they are at unrealistic amounts in my opinion. So ALWAYS find your own numbers. I’m looking for only single family homes, no duplexes or other multifamily. The reason I’m doing this is mainly because of the out of state market I’m buying in. Multi families tend to be in higher crime areas in this city. If and when I start purchasing in a different city I will look into possibly modifying this criteria. The single family homes should be at least 3 bedrooms and preferably more then 1 bathroom. I would consider a 3/1 or a 2/1 if the area and numbers are great. Its easier to rent and/or sell houses with 3 bedrooms and more then one bath. This will make your exit plan easier if you ever need to have one. The properties provided from the turnkey provider should include a new rehab with all new or newer mechanicals including roof, HVAC, water heater, updated electrical, and updated plumbing. Not all turnkey sellers will offer this and its possible I may allow one of these to slide as long as I include my own costs for updating the mechanical and the returns still fit my minimum 15% COC return. 5) Not in the ‘hood! The neighborhood the SFH (Single Family Home) is in should be in a low crime area. Foundation issues can be quite costly and only get worse in time if not remedied. The purchase price must be absolutely no more then actual fair market value. Since I am doing lender financing on all of these the house must be able to meet the appraisal demands. If you find a turnkey provider that will not allow you to do an inspection or an appraisal or allow you to be able to purchase the property via financing then I have 3 words for you. Run Forest Run!! I’ve spoken to numerous turnkey providers and have seen this in action. I would never do business with this type of seller. Last and most definitely not least is that you must have a good property management team lined up to take over the property. Be sure to do proper due diligence on the property management team and confirm they are reputable and meet your standards. Make sure your property management has these Property Management Top 10 Qualities. If you want to see actual numbers from my first turnkey property, click here. If you want to see actual numbers from my second turnkey property, click here. If you want to see actual numbers from my third turnkey property, click here. Great job sticking to a 15% cash on cash return. Out of state rentals are VERY risky. Thanks NNL. I appreciate the comment. You’re absolutely correct. Out of state rentals can be super dangerous if you don’t do the proper due diligence on them. 15% is my bare minimum but luckily I have been able to find some really good cash cows exceeding my 15% criteria. We’ll see what happens in the future. Good article , I am doing research these day , talked with a turnkey provider yesterday , can u tell me your favorite turnkey company ? Do we need an LLC to do the invest?